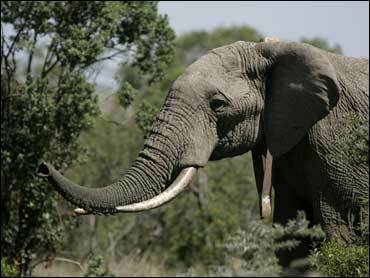 The text message from the elephant flashed across Richard Lesowapir's screen: Kimani was heading for neighboring farms. The huge bull elephant had a long history of raiding villagers' crops during the harvest, sometimes wiping out six months of income at a time. But this time a mobile phone card inserted in his collar sent rangers a text message. Lesowapir, an armed guard and a driver arrived in a jeep bristling with spotlights to frighten Kimani back into the Ol Pejeta conservancy. Kenya is the first country to try elephant texting as a way to protect both a growing human population and the wild animals that now have less room to roam. Elephants are ranked as "near threatened" in the Red List, an index of vulnerable species published by the International Union for Conservation of Nature. It's a huge relief to the small farmers who rely on their crops for food and cash for school fees. Basila Mwasu, a 31-year-old mother of two, lives a stone's throw from the conservancy fence. She and her neighbors used to drum through the night on pots and pans in front of flaming bonfires to try to frighten the elephants away. Once an elephant stuck its trunk through a window into a room where her baby daughter was sleeping and the family had stored some corn. She beat it back with a burning stick. Another time, an elephant killed a neighbor who was defending his crop. "We had to go into town to tell the game (wardens) to chase the elephants away or we're going to kill them all," Mwasu remembered. But the elephants kept coming back. Batian Craig, the conservation and security manager at the 90,000 acre Ol Pejeta conservancy, says community development programs are of little use if farmers don't have crops. He recalled the time when 15 families had their harvests wiped out. "As soon as a farmer has lost his livelihood for six months, he doesn't give a damn whether he has a school or a road or water or whatever," he said. Iain Douglas-Hamilton, founder of Save the Elephants, said the project is still in its infancy - so far only two geofences have been set up in Kenya - and it has its problems. Collar batteries wear out every few years. Sometimes communities think placing a collar on an elephant implies ownership and responsibility for the havoc it causes. And it's expensive work - Ol Pejeta has five full-time staff and a standby vehicle to respond when a message flashes across a ranger's screen. But the experiment with Kimani has been a success, and last month another geofence was set up in another part of the country for an elephant known as Mountain Bull. Moses Litoroh, the coordinator of Kenya Wildlife Service's elephant program, hopes the project might help resolve some of the 1,300 complaints the Service receives every year over crop raiding. The elephants can be tracked through Google Earth software, helping to map and conserve the corridors they use to move from one protected area to another. The tracking also helps prevent poaching, as rangers know where to deploy resources to guard valuable animals. But the biggest bonus so far has been the drop in crop raiding. Douglas-Hamilton says elephants, like teenagers, learn from each other, so tracking and controlling one habitual crop raider can make a whole group change its habits. Mwasu's two young daughters play under the banana trees these sultry evenings without their mother worrying about elephants. "We can live together," she said. "Elephants have the right to live, and we have the right to live too."